It’s 2044. The earth is in shambles courtesy of pollution, overpopulation, and the dog uprising of 2039. With the aid of next-level sci fi technology humankind is exploring the galaxy in search of a new home. We’ve gotten far, planted flags all over the place like overzealous golf caddies, but we have yet to find a suitable replacement. Things look bleak for the future of our species. A shiny spaceship nears a promising new planet in a far away galaxy, one brimming with potential for life and colonization like we have never seen before. A new hope. It gently nestles down on the grassy terrain. Out steps an intrepid space explorer, our hero, looking to the alien horizon with a sense of pride and destiny. They daringly take off their helmet and take the first breath of this new, perfect world’s air. They then utter these historic words: “I shall name this new home for humankind after my parent, and I will name its moon halloweencostumes.com, for without both I would never have become an astronaut.” This is your child, all grown up. They decided to become an astronaut when you bought them our Toddler Astronaut Costume when they were two and a half. We saved the human race and now we are immortalized. Feels good, doesn’t it? 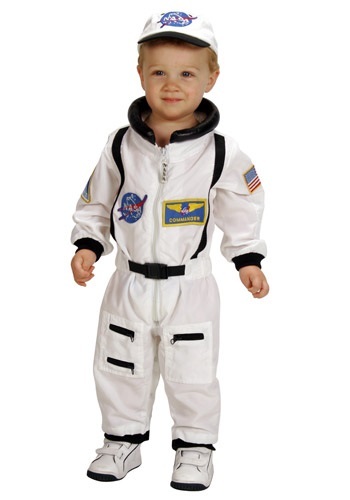 The Toddler Astronaut Costume looks just like the real thing. Easy to put on with lots of authentic-looking accents like faux leather, zippered pockets, and NASA and American flag patches, your little one will look like they’re ready to head for the stars -- as soon as they figure out how to pour their own glass of Tang! A little hat pulls the whole ensemble together.